Friday afternoon. You drive up to the Burj Khalifa, get your car valet-ed. Walk through the long corridors within the building, and you get to – The Burj Club. 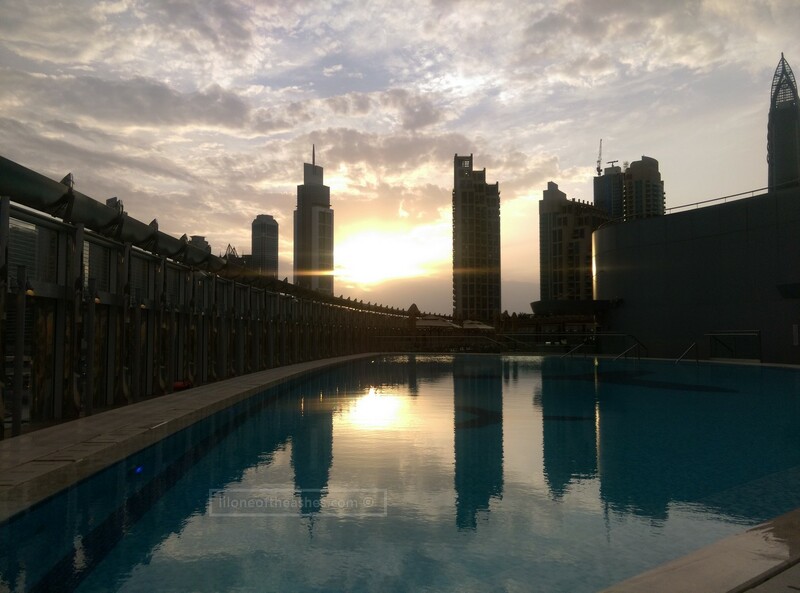 Get into the lifts, walk out onto a wooden terrace with a pool that is overlooking the fountains and the Dubai Mall. Live DJ with chilled music playing in the background, you are sat onto one of the many tables. Have some food and drinks, take a million photos. Check into Facebook. Twitter. Instagram. Bla bla bla. Few hours in, you decide it’s time for a swim. Dessert is served, and you ask for it to be moved to the poolside. You go in for a dip, a few laps, you lay on you back and watch the towering Burj Khalifa staring down at you. You come out of the pool, famished. You walk back to the buffet spread and ask for another plate of freshly cooked pasta, with creamy sauce, saffron and mushrooms. Some beef sliders, and fries as well. They serve this back to you by the pool, while you sip on watermelon juice (or a glass of wine…). You take a nap, and when you wake up, the sun is almost setting. The fountains come up. You watch this, and it gets dark. The lights on the Burj Khalifa, twinkling above, and it’s absolutely beautiful. The pool is shut, serene – and all the colours around, vivid. And that’s how we spend on of the Fridays few weekends back, at the Burj Club Rooftop Brunch (to be noted it was an invite). How much would it cost you, for the non-alcoholic package? 295 AED. That includes fresh juices and hot coffee and tea. And, pool access. And no one will chase you away – we were literally the last to leave as the little one was asleep on the sunbeds and we were waiting for her to wake up. How was the food, you may ask? It’s one of those – it was just alright-type of brunches. Unfortunately not a lot of buffet-type brunches wow us anymore. You get the usual assortment of salads, there’s an arabic counter with samosas and kebbehs, there’s beef sliders, fries and mini pizzas. There’s a roast station – chicken and root vegetables. My favourite? From the pasta station, the creamy pasta with saffron and mushrooms. I must have had 2-3 servings of those and if it’s there when you go, I highly recommend it. Carbs-overload, which I justified to myself by having a few laps in the pool afterwards. I’m glad they served the dessert to table, it would have been a mess if they left it outside in the sun. It was nice to have that by the pool as well. Ambience? There was a live DJ, music wasn’t too loud – it’s not a party type of atmosphere, more…. civilised, if you know what I mean. As in, I didn’t see any drunk adults jumping into the pool afterwards 😉 It’s nice, and chilled. Is it kid-friendly? They have an area with little colourful tables and chairs for the big kids who would be good enough to sit there – and they give you a set of Patchino colouring set with chocolates which was a treat! Not that our girl got to eat any of that chocolate nor can she do any colouring at this age, hehe. The more for us. They don’t have any entertertainment per se for babies or kids other than that – though the pool is perfect for the older ones. When we were by the pool, there were kids swimming around and playing whilst their parents were dining just next to it. That’s one good thing – that the pool is literally within eye-sight (whereas most of the brunches with pool access are in “big” hotels so the pools are further … Giardino (Palazzo Versace)/ Doubletree Hilton JBR’s. Tough one. The price is adequate for where it is, the view, the pool access. However, other than the saffron mushroom pasta, it felt like all the other food was just to fill you up – nothing else was memorable. The asparagus served with the chicken was too tough, the roast chicken itself was a bit dry. It would be good to have some salmon with the sushi served, not just small vegetarian sushi. I’ll say, keep the pasta station (it’s always good to have live stations), and if all the other buffet dishes works with the other guests and you have had no complaints, keep it as it is.. but introduce one or two more serve-to-table platters. A seafood platter served on ice with mussels, prawns, crabs, and if it doesn’t break the budget, oysters (re: The Manor Brunch at Brasserie Quartier). This always gets the crowd going. Or, cold starters to the table instead of out there at the buffet. Watch your playlist. Heard some profanities within the songs played whilst I was in the changing room. More umbrellas by the pool. There were only one when we were there, and we were advised that they were all used for the brunch by the tables. With summer coming up, it would be good to have more shade for those who opt to chill poolside. If (and only if) you want to sell this as a family-friendly brunch, suggest to have a bit more than just the colourful tables and chairs by the buffet spread. A little gated soft-play area for the little ones? Would I recommend this to friends? Disclaimer : We were guests of The Burj Club at Burj Khalifa to review the Rooftop Brunch. Thoughts are our own, though it is entirely up to you to judge.